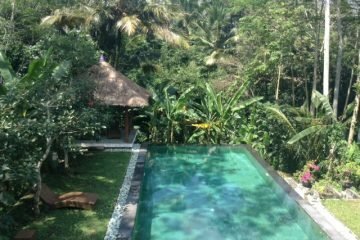 At the edge of a traditional village this property is located only 7 km from Ubud, the traditional, spiritual and artistic center of Bali. To Sanur it is a 20 minute car ride and the airport is reached in 45 minutes. This spectacular property has a total land size of 5000 sqm (50 are). It comprises of a spacious villa on 2500 sqm (25 are) of land surrounded by exotic gardens and rice fields. 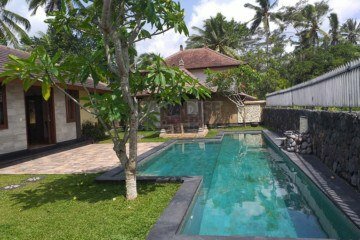 This comfortable 450 sqm villa is built to high western standards with 5 large bedrooms and en-suite bathrooms, one with a Jacuzzi bathtub, and a large kitchen and living area. All rooms open up to covered terraces facing the 15 x 5 meter overflow infinity pool. The villa is beautifully furnished and equipped with all modern amenities like built-in wardrobes, air conditioning, minibars and safe deposit boxes in every room. Good wifi available on the whole property. The most spectacular feature is a unique roof garden, which is fully covered with grass and overlooks endless rice fields. Ideal for Yoga classes, weddings or family and friends gatherings. Adjacent to this 2500 sqm land plot with the main villa, there is another plot with 2500 sqm comprising of a Limasan house with 2 bedrooms and bathrooms, 1 spacious office and storage building, as well as the covered garages at the entrance gate. There are more open parking spaces next to it and good access from the main village road. Within the gated property there is a 3 meter wide road leading to the main villa with another garage and more parking spaces.